Kelly was chosen by the Buccaneers in the second round of the 1998 NFL draft. 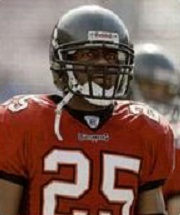 He intercepted one pass as a rookie and became part of a cornerback rotation with Ronde Barber in 1999. The rotation continued in 2000, with Kelly primarily known for his physicality at the position. Kelly moved into the starting job across from Barber in 2001. Buccaneers went 7-9 to finish third in the NFC South. 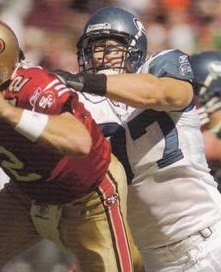 Kelly suffered a chest injury in 2003 and was limited to five games. He came back strong in 2004 and intercepted four passas and continued to distinguish himself with his aggressive play. Following a 2005 season in which he was sidelined for most of the schedule due to turf toe, Kelly came back for one more year with the Bucs before departing to Detroit as a free agent. He appeared in 11 games in what was his last pro season before being released. He intercepted 22 passes, all with Tampa Bay,over the course of a solid career. Chosen by the 49ers in the second round of the 1983 NFL draft to address the unsettled situation at running back, and better known in college for his blocking ability, Craig teamed at fullback with veteran acquisition RB Wendell Tyler and gained 1152 yards from scrimmage (725 rushing, 427 receiving). 49ers went 10-6 to finish second in the NFC West and qualify for the postseason as a wild card entry, while leading the conference in total yards (5920) and touchdowns (53). Lost NFC Wild Card playoff to New York Giants (17-3). Craig split time with HB Joe Cribbs in 1986 but had a second Pro Bowl year in ‘87 as he gained 1307 total yards in the strike-abbreviated season (815 rushing, 492 receiving). 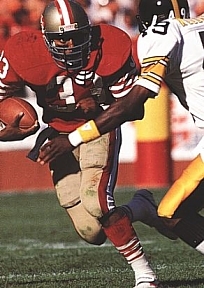 Craig received NFL Offensive Player of the Year honors in 1988 while rushing for 1502 yards and catching 76 passes for 534 yards as the 49ers advanced to a Super Bowl victory. He had a fourth Pro Bowl year in 1989, gaining 1054 yards on the ground and 473 through catching passes as the 49ers won another championship, but, after absorbing seven years of punishment as a versatile all-purpose back, his productivity began to drop off thereafter. After one last year with the 49ers in ’90, he moved on to the Raiders and then two final years in Minnesota, never gaining more than 590 yards rushing in any of his last four seasons or catching more than 25 passes. He retired with totals of 8189 rushing yards and 4911 receiving yards on 566 receptions, a total of 13,100 yards from scrimmage. Garrison gained 1272 pass receiving yards in San Diego State’s air-oriented offense, setting a school record with 26 touchdowns. He twice received Little All-American honors and appeared in the East-West Shrine Game as a senior. Garrison was a future draft pick of the Philadelphia Eagles and Chargers in 1965. Joining the Chargers in 1966, he moved into the starting lineup as split end in place of the injured Don Norton across from star flanker Lance Alworth during his 1966 rookie season, catching 46 passes for 642 yards (14.0 avg.) and four TDs. The speedy Garrison followed up with 44 receptions for 772 yards (17.5 avg.) in 1967 and 52 catches for 1103 yards (21.2 avg.) and 10 TDs in ’68 when he was selected to the AFL All-Star Game. Plagued by injuries in 1969, Garrison’s numbers dropped to a still-impressive 40 catches for 804 yards (20.1 avg.) with 7 TDs. Chargers went 5-6-3 to finish third in the AFC West. Garrison followed up with Pro Bowl seasons in 1971 and ‘72, catching 42 passes for 889 yards (21.2 avg.) and 6 TDs in ’71 and 52 for 744 yards (14.3 avg.) and 7 scores in ’72. 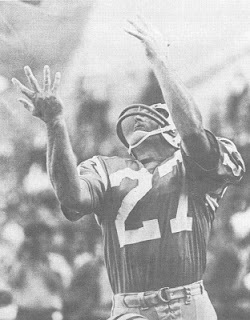 He spent a total of 11 seasons with San Diego, until 1976, catching a total of 404 passes for 7533 yards (18.6 avg.) and 58 touchdowns. He appeared in one game with the Houston Oilers in 1977 after being let go by the Chargers and caught one last pass for five yards to close out his career. Garrison received second-team All-AFL or All-AFC honors twice and was chosen to three Pro Bowls.